Not all sarcasm is bad, and in the right situations it can be useful if not hilarious. So use it sparingly and with caution. We are a nation steeped in sarcasm. You can't scroll through Facebook without seeing a meme laced with it. And we absolutely adore TV characters like House or Dr. Cox from Scrubs that radiate sarcasm. Sarcastic humor is downright priceless and applicable to many of our own situations. However, meeting a sarcastic person face-to-face can be an entirely different experience. Depending on the context and delivery, you may not find the social encounter all that entertaining. Sarcasm can sometimes be hard to interpret. But whether you love it or hate it, recent research shows it also has another benefit. It can boost your creativity. Scientists from Harvard, Columbia, and INSEAD business school were curious if sarcasm had any effects on a person's cognitive abilities. So they decided to run a little experiment. To start, people were randomly assigned to different groups. Each group would then participate in a simulated conversation that was either sarcastic, neutral, or sincere. After the simulated conversations, the scientists ran individuals through a number of creative tasks to determine any differences in their creative abilities. The people that had given or received sarcastic remarks in conversations outperformed those who didn't. In fact, they were found to be about 3 times more creative. "Not only did we demonstrate the causal effect of expressing sarcasm on creativity and explore the relational cost sarcasm expressers and recipients have to endure, we also demonstrated, for the first time, the cognitive benefit sarcasm recipients could reap"
The creative benefit is thought to be driven by the abstract nature of sarcasm. Both the giver and the receiver had to mentally work out the contradictory nature of sarcasm for it to be effective. The mental processes involved in the interpretation and delivery seems to flame the creative spark. Their findings were recently published in the journal Organizational Behavior and Human Decision Processes. While there are some common clues to sarcasm, we all have a sarcastic comment go over our head every now and then. We might even feel a little embarrassed when we realize that we missed something. Turns out, picking up on sarcasm is pretty demanding on the brain. It has even been used by science as a tool in studying social cognition, brain injuries, autism, and dementia. As such, it can also help identify early problems for individuals who have trouble recognizing sarcasm in conversation. One such study used individuals with brain injuries determine which areas of the brain were used in the comprehension of sarcasm. 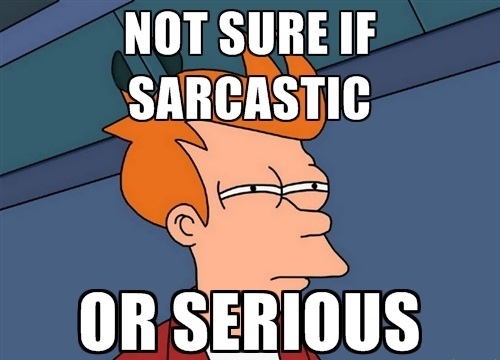 The result of the research identified three areas of the brain needed to recognize sarcasm. A final study found that our white matter also helps us judge who's being the friend - or jerk - in a sarcastic communication. Deciphering sarcasm can be a pretty complex process. But delivery can be just as difficult with it's own set of problems. If you're planning on using sarcasm to tease or compliment someone else, make sure you follow the advice of another study. The most important factors in using sarcasm seem to be correct use of context, situational contrast, and tone of voice. A sloppy delivery could end up giving you blank faces or even a few angry glares. Here's something else you should be wary of when engaging in sarcasm. 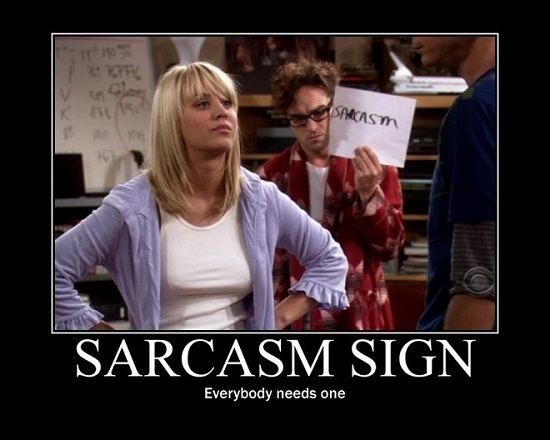 While studying the creative effects researchers noted that the negative side of sarcasm could be softened. The key comes down to trust. As long as there was an adequate amount of trust between the two parties, comments came off as less biting. However, the person delivering the sarcasm usually found the exchange more amusing than the receiver. Still, not everyone will interpret sarcasm as it's intended. Some see it as aggressive or downright mean. Delivered in certain contexts - say a look of disgust or during an argument - sarcasm can easily be toxic in relationships. So using sarcasm from a place of anger or insecurity probably wouldn't be the best course of action. The only thing I fear is that you'll take this wonderful knowledge and use it as justification to be complete jerks to everyone. But that's okay, right? You're only doing it to benefit others. Yeah. I'm sure every one of you is a kind-hearted soul.